Maryknoll Father John Barth in Uganda reflects on Jesus' teachings on the framework for Christian living. 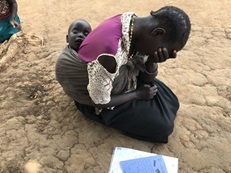 In December, a young widow died of Hepatitis B in the Palabek refugee settlement camp here in northern Uganda. She was 34 years old and she left behind four children, ages 10 months to 14 years old. 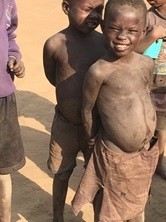 Her brother Charles and his wife Gloria (seen in the photo) took in the children as if it were no big deal – even as poor as they are (and they have four kids of their own). God bless people like that. Unfortunately, Charles himself recently tested positive for Hebatitis B and now has to track the disease the rest of his life. 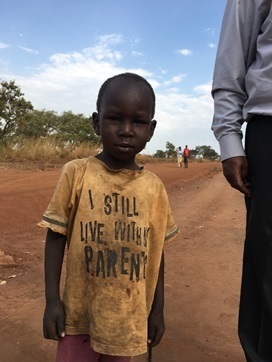 These days I am helping more and more sick people referred to hospitals in Uganda from both the refugee camp and South Sudan, two places that don’t have resources for medical care beyond the primary level. My work managing medical programs to reverse blindness continues with many people now able to see again. Luke’s gospel relates Jesus’ Eight Beatitudes to a crowd standing around him on a level stretch of land surrounded by rolling hills. Jesus had spent the previous night in prayer higher up in the hills. He began his sermon by saying “Blessed are the poor.” Jesus made no bones about his identifying with the poor and marginalized people and their suffering. "Blessed are you poor” relying on scarce rations of food from the UN, wearing the same closes day in and day out, unable to buy soap or salt or sugar to sweeten your morning tea… needing medicine or care of a doctor…..for yours is the kingdom of God. "Blessed are you who weep now”….over the loss of friends and family members, homes, farmland, a school to go to, work to improve your life just a little, just about everything you owned…. Why is America living in an age of profound economic inequality? Why, despite the desperate need to address climate change, have even modest environmental efforts been defeated again and again? Why have protections for employees been decimated? Why do hedge-fund billionaires pay a far lower tax rate than middle-class workers? One could also ask why people seeking asylum are turned away from the southern border of the United States with tear gas. I remember what happened to the four children of the poor widow who died of Hepatitis – her brother Charles and his wife Gloria took in the children – even as poor as they are. God bless people like that! Such is the Kingdom of Heaven.